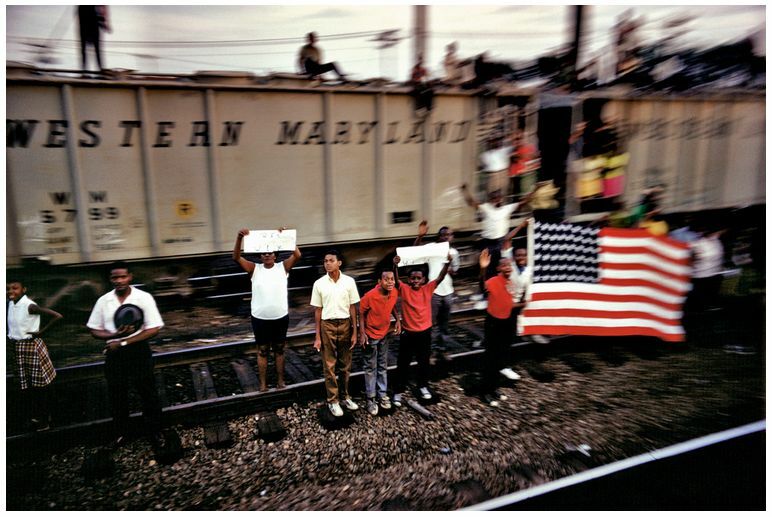 Paul Fusco, 1968 Robert F. Kennedy’s Funeral Train. Paul Fusco is quoted in The Guardian this morning. In 1968, I was assigned by Look magazine to get on the train bearing Robert F Kennedy’s remains from New York to Washington DC. Barred from photographing the Kennedy family in their private car, I took note of the people lined up along the track to pay their last respects, and decided to photograph them. I was surprised that the other photographers on the train either failed to notice them or chose not to take pictures. These photos, first published more than 30 years after RFK’s death, are among the among most important I’ve ever taken. In these poignant photos, you begin to appreciate the full weight of what Senator Kennedy’s assassination meant for some of the ordinary people of the USA, for this the most important part of the news story. This is a lovely example of what I call Countershape territory. By countershape I mean what is being suggested rather than what is immediately obvious – is an elite skill for any creative person. Other examples are easy to find once you get your eye in. Composer John Cage’s revolutionary piece 4’33” (1952) eliminates the sounds of instruments. While each musician within the performance has the potential to break the silence, they restrain themselves; they remain tacet. Cage (in what he considered his most important work) instead invites us to listen to the absence of music as if it were music. In visual art, the countershape it is easy to spot. In Robert Mapplethorpe’s black and white photographs, beautifully-lit skin is surrounded by a dark negative space, which as a shape is as pleasing as the model’s body and contributes equally to the photograph’s composition. While British artist Rachel Whiteread’s work solidifies the countershape and on famous piece House, (1993) casts the interior of an entire Victorian house in concrete – so that the interior spaces of the rooms inside became solid objects. But what about Marketing and Advertising? It takes chutzpah to omit the product completely such as in this example of a press execution for Volkswagen[i]. Its copy reads Volkswagen City Emergency Brake. For when you get distracted. The image is of the distraction: a partially clad woman in a window, and you’ll notice how the car with the special brake is absent. Not a bad example of the use of countershape territory, although it seems to be fairly sure that its potential audience will find themselves attracted to women. [i] Adam&Eve DDB Credits – Executive Creative Director: Jeremy Craigen. Art Director: Matt Gay. Copywriter: John Long. Head of Art: Daniel Moorey. Designer: Pete Mould. Group Account Director: Jonathan Hill, Jason Lusty. Account Director: Josh Davoren. Photographer: Jason Hindley. This entry was posted in Countershape, Marketing and tagged advertising, Das Auto, John Cage, Marketing, Paul Fusco, photography, Rachel Whiteread, Robert Mapplethorpe, The Guardian, Volkswagen. Bookmark the permalink.